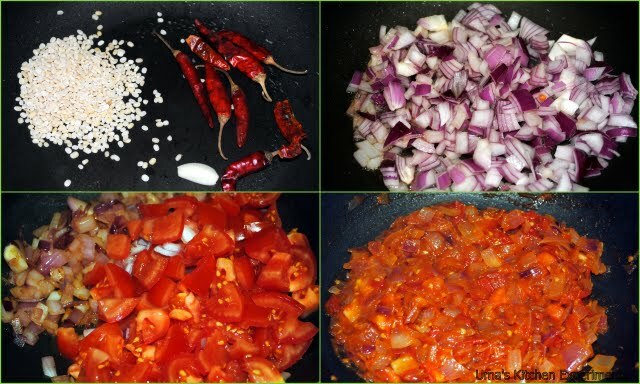 There are many variations for the red chutney served and I have blogged one variation with onion here. 1) Dry roast urid dal, garlic and dry red chillies in pan till it releases nice aroma and become golden brown colour. Transfer to other plate and set aside. 2) In the same pan, add a tablespoon of oil and saute chopped onions till they are soft. 3) Add tomato and continue sauteing till all tomato pieces mashes well. Remove from stove and allow this mixture to cool. 4) Grind the ingredients to a fine paste by adding salt and little water. 5) In a seasoning pan and heat oil. 6) Put Mustard seeds and urid dal and wait mustard seeds to splutter. 7) Turn off the stove and add curry leaves. 8) Transfer the seasoning to the chutney. my fav too...like your version very much..tonight i am going to make this for my dinner...looks so yummy n very nice pictures Uma..super like !!! Nice clicks.. Use pearl onions for much more better taste.. You can also use urad dhal+ channa dhal or even channa dhal alone (for grinding).. This is healthy and good. Love this chutney anytime... Would love with some crispy dosas. simple and yummy chutney to pair with dosa. First time in your blog and this chutney is so mouthwatering and delicious! This and some steamed idlis... mmm.. heaven... l(oi)vely picture! Tangy and yummy chutney..love it. My most favourite chutney, the first picture is amazing. hi Uma...i tried this chutney on that day n today also but forgot to thank you.. Yesterday nite i tried and its a perfect combination for dosa..superbbbbb.